Rep. Gerry Connolly (D) has introduced a bill that would nix the Trump administration’s strict new limits on refugee resettlement in the U.S. The bill, dubbed the “Lady Liberty Act,” was introduced by Connolly and co-sponsored by 60 other members of Congress. 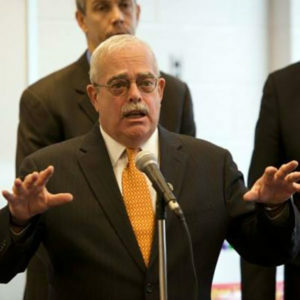 Congressman Gerry Connolly (D-VA), Vice Ranking Member of the House Committee on Oversight and Government Reform, was joined by 60 members in introducing the Lady Liberty Act, legislation to reverse the Trump administration’s recent actions to severely limit refugee resettlement in the United States. The Lady Liberty Act would require the President to set a goal of admitting no less than 110,000 refugees annually. Under the administration’s recent action, refugee resettlements would be capped at 30,000 refugees in fiscal year 2019, down from 45,000 this year. Since 1980, the U.S. has resettled more than 3 million refugees and set an average annual goal of 95,000 refugee admissions. The previous low ceiling for refugee resettlement in the U.S. was 67,000, set by President Reagan in 1986. There are currently 25 million refugees around the world. Connolly’s legislation has been endorsed by The Alliance, CASA, Church World Service (CWS), Ethiopian Community Development Council, Family Action Network Movement (FANM), HIAS, Human Rights First, International Refugee Assistance Project (IRAP), International Rescue Committee (IRC), Islamic Relief USA (IRUSA), Lutheran Immigration and Refugee Service (LIRS), Multifaith Alliance for Syrian Refugees, United States Committee for Refugees and Immigrants (USCRI), Veterans for American Ideals, We Are All Americans.